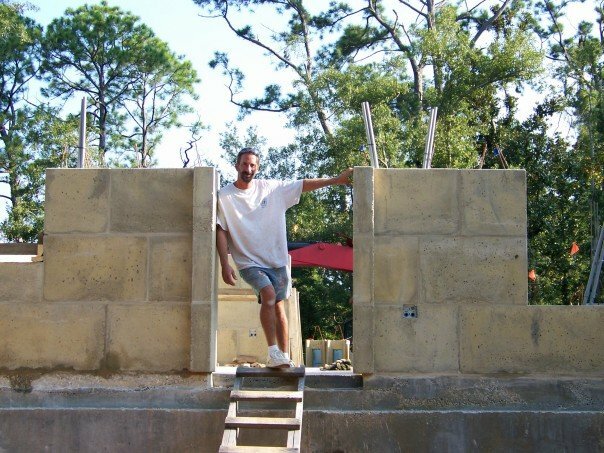 Derek Inman, a Florida contractor who operates under the business name of "Carpentry by Derek", has installed blocks on at least five previous DAC-Art projects. He has been involved in the Golden's project since the slab was poured. He has personally installed every single block with the help of his wife, Ronda. He is pictured below at a point when the house was only three courses high. His reputation is that of a perfectionist and you can judge from the photos below if his reputation is well deserved.